In 2013, Sam and Cameron’s dream life turned into a nightmare when on a family holiday in Thailand with their three boys, Sam unknowingly leant against a rotten balcony railing, falling through it and crashing six metres onto the concrete below. She was lucky to survive as she’d suffered devastating injuries including severe damage to her spinal cord that left her paralysed from the chest down. Broken and hopeless, Sam reached her outer limits of physical and mental suffering. Cameron became carer to Sam who was previously spirited, independent and active which was challenging for all. Life would never be the same. But their love for each other has endured. Blindsided by life, a deep depression set in for Sam, and until a little bird appeared in their lives, the future looked bleak for Sam, Cameron and the boys. From the lowest of lows to the highs of Sam representing Australia as an athlete and her story inspiring an upcoming Hollywood movie, Sam and Cameron’s paths have been anything but ordinary. The book Cameron co-authored with Bradley Trevor Greive, with its achingly beautiful photography has reached and inspired millions, and Sam has reconnected with her love for the ocean and made a return to surfing. In her first year in the sport, Sam won gold and bronze medals in the Women’s and Open Divisions respectively, at the 2018 World Adaptive Surfing Championships in California. 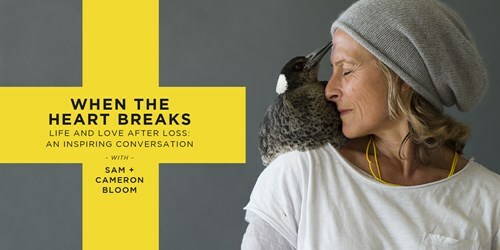 JOIN SAM AND CAMERON FOR THIS INTIMATE AND TRULY TRANSFORMING CONVERSATION, IMAGES, VIDEO AND Q&A - REFLECTING ON LIFE, FAMILY, LOVE, LOSS, GRIEF, DEPRESSION, INJURY, CARING, AND ON NAVIGATING THE NEW LANDSCAPE OF A VASTLY DIFFERENT LIFE AFTER TRAGEDY. Please contact info@talkingsticks.com.au to check availability of accessible seating.